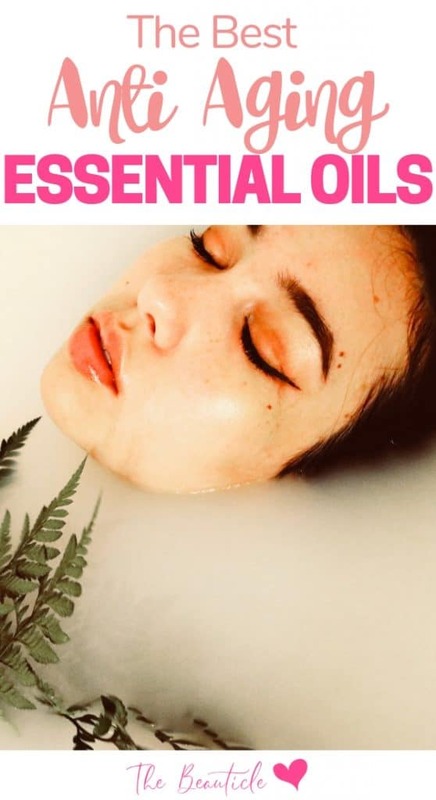 Take advantage of these top anti aging essential oils to keep your skin looking glowing and youthful as you grow older. Aromatherapy can use certain essential oils to make your skin and hair look and feel younger and healthier. You can also reduce wrinkles and age spots, and even combat psoriasis with the physical application and diffusion of specific anti-aging essential oils. The following oils are frequently found in some combination in essential oil blends which natural manufacturers sell for fighting the aging process successfully. There are dozens, if not hundreds, of anti-aging essential oil mixtures sold by reputable, reliable natural product manufacturers. You can also experiment, creating your own wrinkle-removing, skin-clearing, clock-slowing combinations using the above essential oils. Mixed with a carrier oil such as coconut oil, these are powerful natural remedies for wrinkles. Rose oil is not only beautifully scented and powerful, it is also exceptionally effective in keeping your skin elastic. It prevents scarring and slows the development of wrinkles. Rose oil is often used as an “all-around” aromatherapy skin treatment. Sandalwood is great for protecting against damage done by the sun. Not only does it fight UV radiation, but it also helps your skin regenerate from damage quickly. Myrrh essential oil has anti-septic, anti-inflammatory and anti-infectious properties. It’s also a safe, natural astringent. It’s aromatherapy applications work well for many skin conditions. Frankincense is great for fighting the effects of aging because of its anti-inflammatory and anti-infectious properties. Lavender soothes your skin as well as your mind, and reduces the effects of inflammation. It contributes to healthy anti-aging as an antifungal, antimicrobial and “anti just about everything bad” essential oil. The Three Wise Men were very wise for gifting the Christ child with frankincense, as this resin’s aroma is one of empowerment and relief, and its properties span a wide range, from serving as an antifungal, antiseptic, and astringent for skin health, to fighting off respiratory infections with its expectorant and anti-inflammatory properties. This Anti-Aging Ointment combines the skin-fortifying properties of frankincense with those of myrrh, another anti-aging essential oil as well as lemon, geranium, rosemary, carrot seed, and rosehip essential oils. These complimentary oils all have great benefits for your skin. Combined, these oils provide a plethora of soothing and strengthening properties for skin health, loading your layers with antioxidants, which combat free radicals in the body, impacting skin health and normal bodily function. Use this oil, as directed, for younger, glowing, healthier-looking skin. Firm and strengthen skin and reduce signs of aging by blending the ingredients in a dark glass jar until well combined. Each evening, after your normal face wash routine, apply the ointment to wrinkles and other affected areas. Shake the ointment before using, and use regularly for the best results. The Ancient Egyptians and Arabian cultures knew the value of myrrh. They applied it to skin issues, like acne and aging and, though they may not have known that the oil possesses astringent, anti-inflammatory, antifungal, antibacterial, and antiseptic properties, they did know that its effects produced radiant and healthier-looking skin. The aroma was also uplifting and restorative, as the oil’s components trigger support in several brain regions like the pituitary, the amygdala, and the hypothalamus, all of which regulate emotional balance. With these topical properties and this aromatic impact, a solo myrrh essential oil application benefits skin and emotional conditions, but when blended with other synergistic oils like patchouli, lavender, lemongrass, and helichrysum, you have yourself a powerful skin-supporting product. This AntiAging Skin Toner combines all of these skin-supportive oils into a blend that firms your skin and smooths its tone, making it radiant and glowing all over. Follow the below instructions for healthier, younger-looking skin. Brighten your skin’s tone and texture by blending all ingredients in a small glass bottle until well combined. For the best results, regularly apply the skin toner to the face or other affected area three times a day after cleansing and before serum or moisturizer.